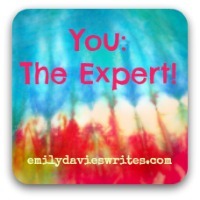 Last week saw our first You: The Expert Linky - your opportunity to show off your knowledge and expertise in whatever area you wish! We started small with three entries (ok, one was my own breakfast bar recipe!) so thanks to those who made it! But from small beginnings come greater things, and I just enjoyed the process and finding out about some of my bloggy friends. Who knew Vic Welton was a driving instructor extraordinaire, eh?! You can read more about the thinking behind You: The Expert here. And check out last week's linky here. So here we are again, it's Wednesday, so take this as your opportunity to show off! Whether you have an amazing recipe, an innovative craft tutorial or a stressed out parent's guide to potty training, I want to know about it! And of course, share the love and comment on at least two other people's posts and if you discover a genius idea, be sure to tweet about it. I've started a Pinterest board so we can all share tutorials in the same place if you so wish. I'm looking forward to learning lots of new things! Spread the word amongst your bloggy friends. I will comment, pin, and tweet every entry. Excellent! Love the peonies, I'm hoping to give it a go myself! Great idea for a linky :) Have got a few tutorials in my head (and old ones on my blog) so will try to make it back here next week! Thanks for joining in! I can tell this is going to be very dangerous for my list of craft projects!